Towards the end of World War One, the tank was extensively looked upon as a new weapon which would decide the fate of ground warfare. The new weapon, of unfamiliar shape, not only astonished soldiers on the battlefield but also deeply impressed the civilian population the world over. It seems that very few people had remembered the track-driven tractor which had been towing a heavy gun as a "mechanical horse" or as a "scene-shifter" behind the muddy battlefields. Those who were in the know were aware that the Holt caterpillar tractor was the origin of the half track and had been the mothrr of the tank which helped to lead the Allies to victory. After the end of WWI, the Holt half track tractor which had been invented originally for agricultural use, continued to be studied in many countries for military purposes. Half tracks wear a happy invention, combining the advantages of full track such as the tank and tractor and those of wheeled vehicles such as the car. Full tracks were superior in cross-country ability, but were inferior in running speeds on roads, and in steering. On the other hand, wheeled vehicles made satisfactory speeds on road but often had difficulty in running cross-country. Half tracks had the advantage of both types of vehicles and few of their disadvantages. However, the half track's main disadvantage was that they were complicated in construction and difficult to maintain. Recognizing the excellent tractive force and cross-country ability of half tracks, the German Army Ordnance Bureau decided in 1932 to develop six military half tracks from a 1 ton to a large 18 ton tractor. Different car makers were ordered to develop one of these. Krauss-Maffei in Munich took charge of a 8 ton half track, because this firm had given attention and study to half tracks since 1928, they completed a prototype named KMm7 as early as 1933. It soon developed into the KMm8 and KMm9, and in 1936 the KMm10 was put into production. 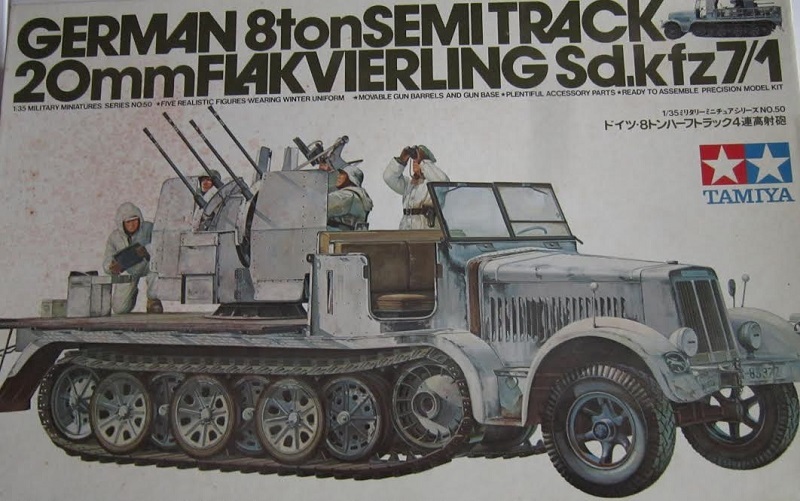 It was not until the KMm10 was born that the 8 ton half track was officially designated "Medium 8 ton Tractor (Sd.Kfz.". The last production model, KMm11 was completed in 1938 and put into production immediately. German half tracks were used in large quantities by the Wehrmacht and all were excellent vehicles built by the cream of German vehicle engineers. 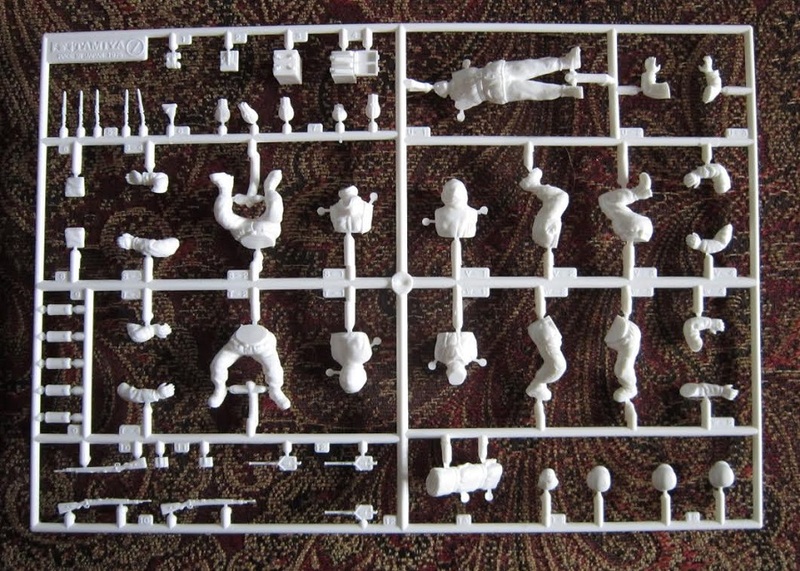 Their engineers' thoughtful consideration was given in their construction and parts. The 8 ton half track stood out amongst the others and was a masterpiece medium tractor which was used for various purposes. In half tracks of the German Army, unlike those of the U.S. Army etc., most of the moving parts were composed of tracks, and therefore their mechanism was complicated and required a great deal of maintenance. 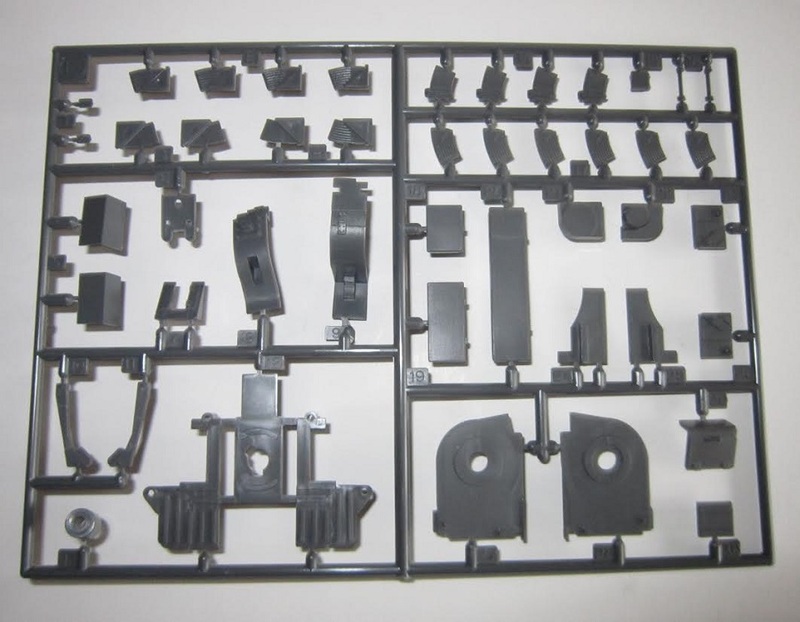 For instance, the differential brake - a device for slowing the rotation of the inside track so that the vehicle could make a quick turn - was designed to interlock with the steering mechanism. The suspension was complicated, but practical in construction and was a happy combination of torsion bars and leaf springs, to which large double bogies, peculiar to German vehicles were fixed. Thus the fruition of the engineers' excellent efforts was seen in every point of the German half tracks, particularly so in the 8 ton half track. The production of the 8 ton half track totalled about 1,200 in number by the end of WWII. Many of them were used as a tractor for the 150 mm heavy field gun or 88 mm anti-aircraft gun. During the middle of the last stages of the war, some of these medium half tracks wer equipped with various weapons. One of them was the 8 ton half track with 20 mm four-barreled AA machine-guns (Sd.Kfz. 7/1). The 20 mm four-barreled gun mounted on the vehicle was an excellent AA machine gun completed in 1940. Two 20 mm AA machine guns, model 38, were arranged in two rows. The gunner seat was behind the gun and whilst ooking through the self-adjusting sight, adjusted the direction of the gun by means of a manual handle. The gun was of the magazine-fed type, and equipped with two loader seats, one on each side. It was designed to be swivelled through 360 degrees, elevated by 100 degrees and depressed by 10 degrees.The maximum rate of fire was 800 rounds per minute. The maximum effective range was 3,700 meters high and 4,800 meters at ground level. Since the four-barreled AA machine gun was called "2 cm Flakvirling 38" (20 mm four-barreled AA gun 38), the 8 ton half track armed with it was officially designated "8 ton Tractor with 2 cm Flakvirling 38 (Sd.Kfz. 7/1). In the first four months of 1945, German Luftwaffe was accompanied by an anti-aircraft battalion whenever they were moved from one place to another. The battalion consisted of one 37 mm AA gun battery (nine guns) and two 20 mm AA gun batteries (six guns each). These batteries laid down a thick anti-aircraft barrage against enemy planes approaching the airfields at low altitude. Pierre Crosstelman, a French volunteer who joined the Royal Air Force and became the French Ace of Aces, said about the AA Battalion in his reminiscences "Big Circus", as follows -"Whenever we approached a German airfield, they immediately laid down a curtain of tracer shells which we could not break through. We had very little chance of escaping at a low altitude through a curtain of shots and shells shot up by 33 guns at the rate of 250 rounds per second. It made everybody's blood run cold. Since the experience over the Rheine Airfield, nobody had tried to confront anti-aircraft artillery around German airfields. I myself was possessed by an inferiority complex against German anti-aircraft guns. Out pilots were completely demoralized". Pierre Crosstelman later attacked a German airfield with his nine Tempes fighters, of which 6 were brought down. Thus, the half track, with 20 mm four-barreled AA guns, became the most formidable opponent of Allied fighters which tried to attack the Germans at low altitude. This powerful weapon was used in quantities by the Army and Schutzstaffel Units and Allied troops were harassed by it in ground combat as well. This kit comes in a shrink-wrapped tray and lid type box. The bo art shows the Sd.Kfz. 7/1 posed against one of Tamiya's signature all-white backgrounds that they use for most of their box arts. The vehicle is in a base of Panzer-grey, with a worn coating of winter white wash over it. The crewmen are all dressed in white winter uniforms. No markings are shown on the vehicle. One side panel has a small color repeat of the box art, followed by Japanese text that I assume is the vehicle's history. There are 2 small color side views. One is of this vehicle version and the other is of a troop carrier variant. This is followed by MADE IN JAPAN. No kit numbers are given for these 5 kits. Tamiya's street address in Japan is provided here. 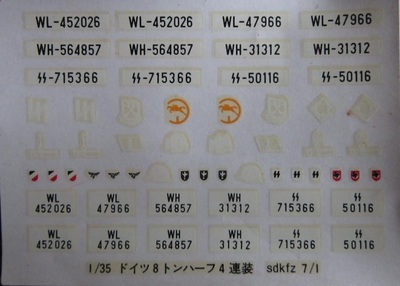 This kit contains 5 panzer-grey parts trees, 1 chalk white tree, black vinyl treads and poly caps and the decal sheet in staple-sealed cello bags. 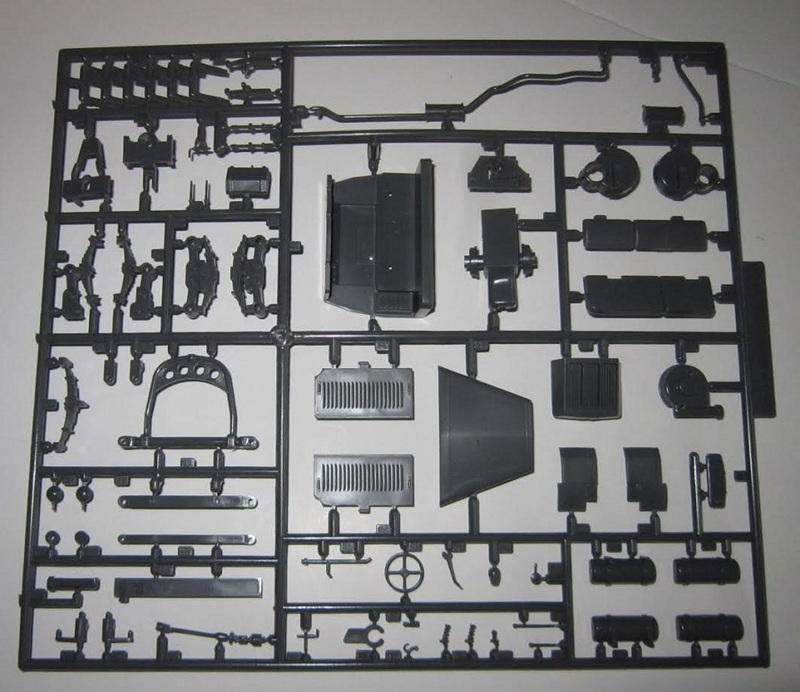 A loose panzer-grey chassis part, 2 black vinyl tires and 2 metal rods and a screw in a small cello bag. 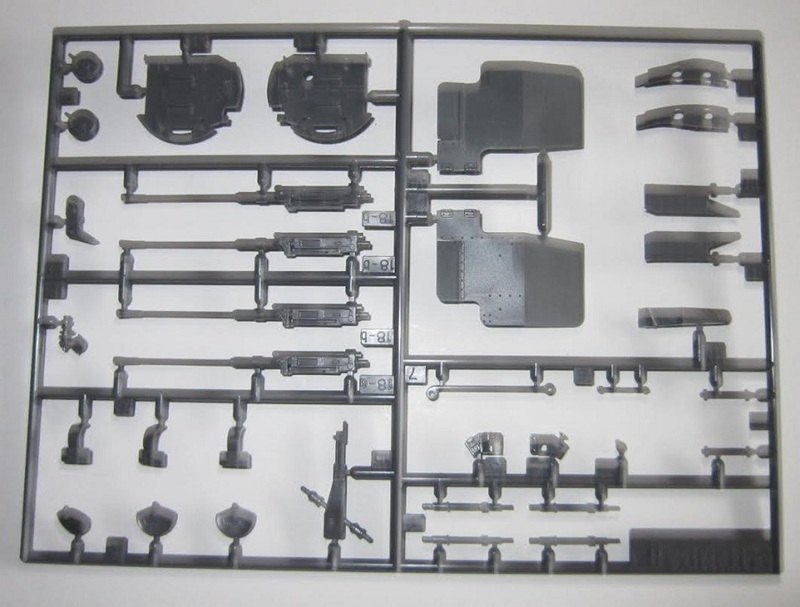 There is supposed to be a section of plastic screen to use on the fold down walls of the fighting compartment, but if it was ever in the kit it is gone now. Also the clear windshield pane is missing. I can fabricate both thankfully. The instructions consist of a single sheet that accordion-folds out into 8 pages in 8 1/2" x 11" page format. Page 1 begins with a black and white repeat of the box art, followed by the history of the Sd.Kfz. 7/1 in Japanese. Page 2 through 7 give a grand total of 18 assembly steps. Page 8 is the painting and marking instructions with a 3-view and a black and white photo showing the half-track made up from above. All the text is in Japanese only, with little or nil in English. ​There is no letter D parts tree. A tube of glue is included in the kit along with the decals. ​There is supposed to be a clear windshield pane, but I found it nowhere in the kit. 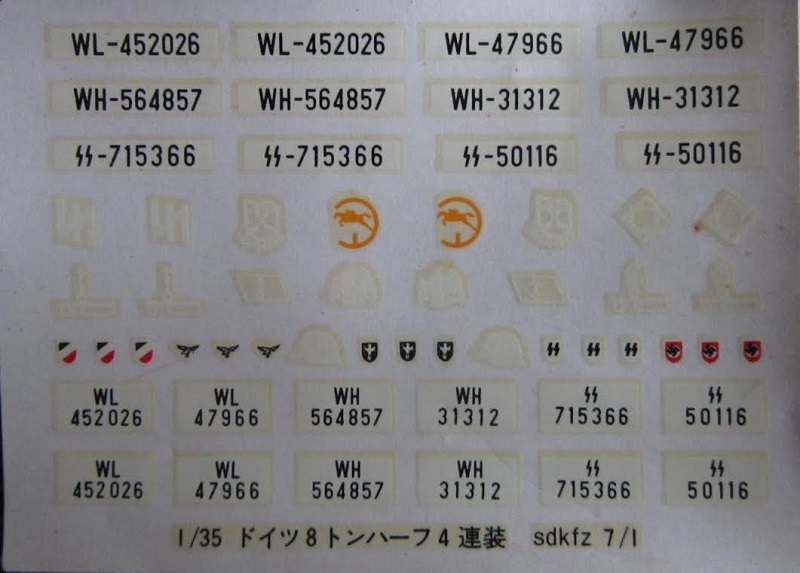 Over the years I've had this kit, I either lost this part or Tamiya never put it in the kit at the factory. This also holds true about a section of plastic screen that is to be used to go inside the fold-down walls of the fighting compartment. Also, not in the kit. I can make the windshield out of a piece of clear sheet I have and the screens can be fabricated from house window screen. 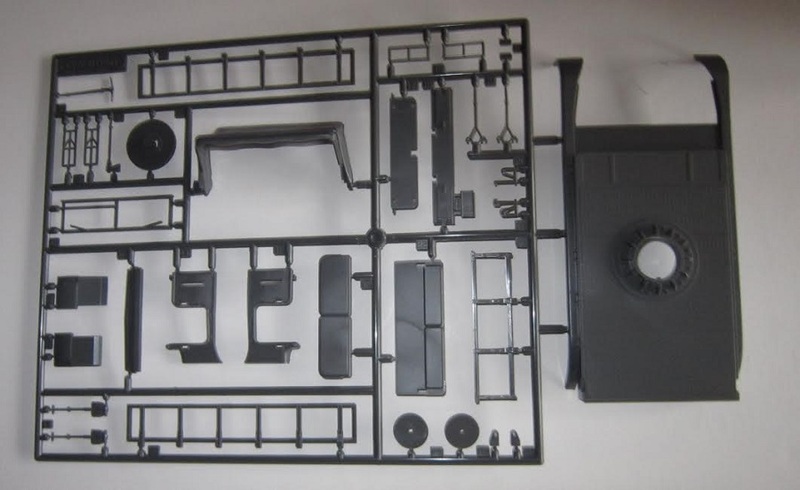 The final items in the kit are the 2 black vinyl tires and treads and two steel rods to use for axles and a steel screw and nut to use to secure the front axle housing. 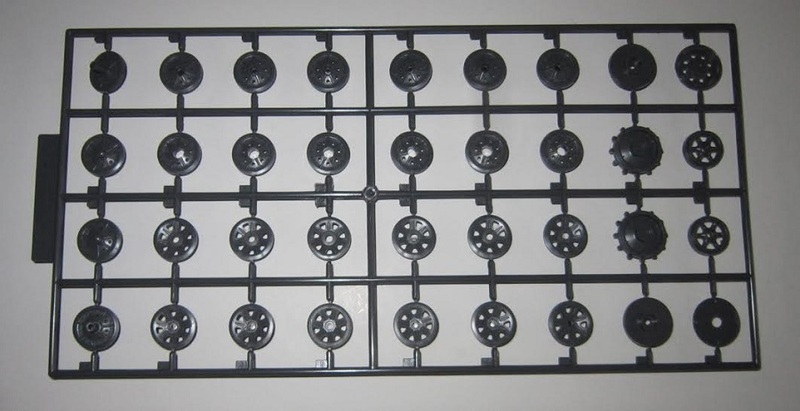 Also included are the 18 poly caps to mount the front wheels and the half track road wheels. This kit has a lot of great detail on it. Highly recommended.